A wholesome, hearty, nutty wholewheat bread that goes wonderfully with a cold meat platter, fruit or cheese plate. Perfect toasted for a nutritious and healthy breakfast too. In a mixing bowl, add in wholewheat flour and make a well in the center. Crumble the fresh yeast into the well and add in 80 ml water and sugar. Stir together and leave it for 15 minutes. Peel, core and grate the apple. Add in sourdough starter, grated apple, flours, salt, walnut oil, water, honey, millet, sesame seeds, flaxseeds and chopped walnuts. Stir everything together on low speed until incorporated, then increase the speed and stir until a smooth and soft dough forms. Cover and set aside to proof for an hour. Gently knead the dough and divide into two portions. Shape one portion into a round and another into a log. Place the round dough, seam side up, into a well-floured proofing basket and another one into a parchment paper lined loaf pan. Dust the surface with flour and cover with a clean towel. Set aside to proof for a further 60 minutes. Preheat the oven to 220C/430F. Turn the boule out onto a wooden peel dusted with cornmeal. Sprinkle some flour over dough and cut some decorative slashes on the top of bread. Make a long slash lengthwise down the center of top of the loaf in the loaf pan. Bake for about 45 minutes until nicely golden brown. A pilaf or pilau is a Middle Eastern rice dish that is cooked in broth and spices. It may contain a variety of vegetables and meat. This is a delicious recipe for using up leftover roasted chicken or turkey, and works well with seafood too. Melt the butter in a saucepan over medium heat. Add the shallot and saute until tender. Add in allspice and crushed garlic and stir briefly. Add in brown rice and stir until the rice is coated with the butter. Pour in vegetable broth. Bring to the boil then immediately turn down to a simmer. Cover and cook for 30 minutes. Turn off the heat. Add in dried figs and let sit, covered, for 10 minutes. Season with salt and pepper and gently fork through the roasted chicken, Brussels sprouts and chopped parsley. Shower with pomegranate seeds at the last minute. A soft,tender, lightly sweetened two-toned yeast chocolate bread swirled with a layer of orange chiffon cake. Not only is it DELICIOUS, it looks quite pretty when you serve it. They are excellent when toasted and spread with butter or jam for a satisfying breakfast or afternoon snack. Alternatively, you can replace the cocoa powder with milk powder (or just flour) to prepare a sweet bread dough, then topped with a disc of chocolate flavoured foam cake. In October, I was the very LUCKY winner of $40 Amazon gift card from Choc Chip Uru - Go Bake Yourself. Uru is a 17-year-old culinary genius and a serious chocolate fan. Please head over to her space and learn more her baking, her fun undercover stories. The cookie stamp and cupcake decorating set I have bought with the gift card have finally arrived this Saturday. Thank you once again, Uru! In a large mixing bowl, combine spelt flour, bread flour, cocoa, salt, brown sugar and the instant dried yeast. Blend well. Warm the milk and butter in a saucepan to about 40C/100F. Lightly beaten the egg and add warm milk mixture and vanilla extract. Whisk together. Make a well in the center of flour mixture, pour in the liquid mixture. Stir with a dough hook at slow speed for 1 minute. Increase the speed to the medium and continue to knead until smooth, and the dough leaves from sides of the mixing bowl. Add more flour if necessary. Turn out the dough and shape into a ball. Lightly grease the mixing bowl and return the dough ball into the bowl, turning to grease all sides. Cover and proof the dough in a warm place for about two hours until it doubles in volume. Knead the dough a few times on a lightly floured work surface, cover and let rest for 5 minutes. Roll out the dough into a large oval shape and top with the chiffon cake. Roll up like a jelly roll, placing the seam side down into a 33-cm loaf pan. Butter a piece of plastic wrap and place loosely over the dough. Let rise again until doubled in size, about 1 hour. Preheat oven to 180C/350F and place bread in the center of the oven. Bake for about 40 minutes. Let cool for 10 minutes, then remove from pan and cool on wire rack. I'm submitting this to We Should Cocoa - Bread this month, hosted on Chocolate Log Blog and Chocolate Teapot. Another daily bread，adapted from Küchen Götter， contains grated carrots, plain yogurt and seeds such as flax seed, quinoa, buckwheat and amaranth, which are all good for you. Whisk together bread flour, spelt flour, sugar, and salt in a mixing bowl. Make a well in the center. 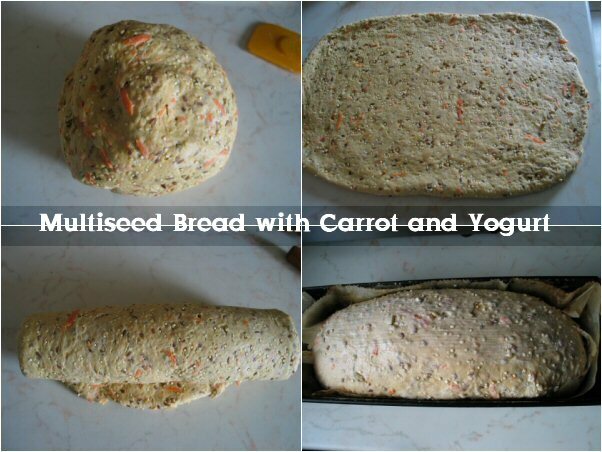 Add in seeds, grated carrot, 50 grams of yogurt and water. Stir at first on low speed until a rough dough begins to form. Increase the speed and beat until the dough is smooth and elastic. Turn out the dough and shape into a ball. Return it to the mixing bowl. Cover with a kitchen towel leave it in a warm place for an hour or until it’s doubled in size. On a lightly floured work surface, roll the dough into a rectangular shape and roll it up. Place it into a parchment paper lined loaf pan. Cover again with the towel and set aside in a warm place for 50 minutes to rise. Preheat the oven to 200C/400F. When the loaf has risen, brush the surface with the rest of yogurt and bake for 50 to 60 minutes until nicely golden brown. This is a twist on a classic Italian antipasta - Insalata Caprese, using roasted beetroot instead of tomatoes and quinoa for a healthy and satisfying lunch salad, which is very easy and quick to put together. Cut the roasted beet into 1cm thick slices. Drain and slice the buffalo mozzarella into thick pieces. Arrange them alternately on a serving platter so that they overlap. Cut the chives into thin rings. Whisk together the olive oil, lemon zest, lemon juice, pinch of sugar, salt and pepper in a bowl. Pour half of the dressing over the salad and allow it to marinate for 5 minutes. Toss the cooked quinoa with the rest of the dressing and some chives. Mound the well tossed quinoa in the center of the beet-mozzarella salad. Sprinkle some chives and sea salt over. These chocolate star cookies are special for the holidays or any time you crave sweets. The cookie dough was prepared with spelt flour, cocoa, and marzipan, and formed into stars. They are very tasty and pretty enough, thanks to the white chocolate coating and pink peppercorns, to decorate the X’mas tree or give away as the presents. In a large mixing bowl, whisk together spelt flour, baking powder, cocoa powder, salt, powdered sugar, nutmeg and orange zest. Add in diced butter, marzipan paste, egg and vanilla extract. Mix until you have a smooth dough. Shape the dough into a disc, then wrap in plastic film and refrigerate for 30 minutes before using. Line two baking trays with parchment paper. Preheat the oven to 160C/320F, fan-forced. Remove the dough from the fridge and place it between two pieces of plastic film. Roll it out to 3mm thick. Cut with a 5cm star cookies cutter or any shape you prefer. Bake the cookies for about 12 minutes. Remove and cool on pans. Meanwhile, cut the white couverture into smaller pieces and place them in a heat proof bowl. Set the bowl on a pot of hot water. After 10 minutes, give the chocolate a good stir until completely smooth. Dip the cookies with white chocolate and garnish with pink peppercorns. Place coated cookies on wax paper and let stand until firm. Treacle tart, a classic English dessert, is sweet, comforting and moreish. It is made using shortcrust pastry, with a decadent filling made of golden syrup, also known as light treacle, breadcrumbs, and lemon juice. The tart is normally served hot or warm with fresh cream or custard. The use of lemon and apple cuts through the sweetness and turns this into an unforgettable treat. The word treacle refers to all forms of syrups made during sugar refining, from golden syrup through to black molasses. I have used walnuts to replace half of the breadcrumbs and added 2 tablespoons of crystallized ginger for a nutty and spicy filling. To make the pastry, mix the spelt flour, ground walnut, icing sugar, salt and butter to a crumb-like consistency. Add the egg and, if necessary, a tiny drop of water to bring the dough together. Shape dough into a disc, wrap in clingfilm and refrigerate for an hour. Heat the oven to 190C/375F. Roll out the dough thinly on a lightly floured surface and line the base and sides of a 28 cm/11 inch tart tin. Trim the excess, line with baking parchment and dried beans, and bake for 15 minutes until starting to colour. Carefully remove the paper and beans, then bake for a further 10 minutes until pastry is golden. Cool. In a food processor, blend together the buckwheat bread, walnuts, chopped crystallized ginger and raw sugar until fine breadcrumbs form. Set aside. Place invert sugar syrup, butter, palm sugar, lemon juice, coconut cream, vanilla extract and nutmeg in a small saucepan and stir over medium heat until the mixture bubbles and well-blended. Whisk in prepared breadcrumbs until combined. Pour into tart shell. Quarter apples, core and cut each into 2-3 wedges. Starting at the edge of the tart, arrange apple wedges in concentric circles. Scatter the chopped almonds over if using.Bake for 35 minutes or until firm to the touch. Cool for 15 minutes. Serve warm or at room temperature dusted with extra icing sugar or whipped cream.